Pluto is the lost planet of the Solar System. 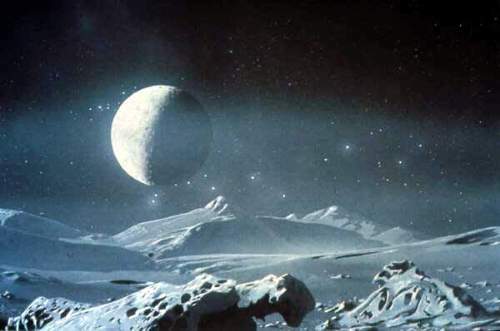 Now relegated to being a dwarf planet, Pluto will slowly give up its secrets when a NASA space probe gives us our first proper taste of this frozen world. Pluto was first discovered in 1930 by Clyde Tombaugh. Using a blink comparator to rapidly look through photographs Tombaugh noticed an object that moved between one photograph and the next. Pluto was born. 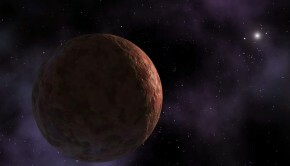 The dwarf planet Pluto has one of the most variable orbits in terms of distance from the Sun. At its closest, Pluto is almost 30 Astronomical Units (AU) away from the Sun while at its farthest this stretches to nearly 49 AU. One AU is the distance between the Earth and the Sun. Because its so far from our star it takes Pluto over 246 years to complete one orbit. The upgraded Hubble Space Telescope showed the surface of Pluto to have a highly varied landscape with black and white areas interspersed with large areas of orange. Hubble’s images also revealed a highly dynamic surface with changing colours which indicate seasonal variations. 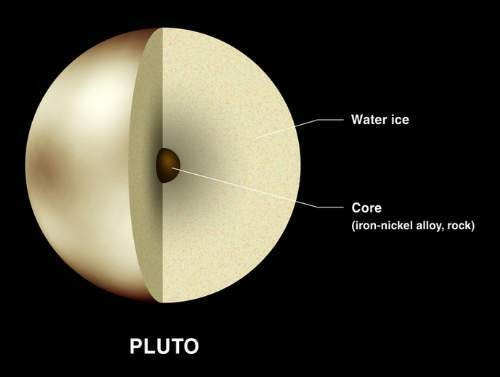 Pluto’s is thought to be composed of up to 70 per cent rock which forms its core. It is also believed to have a mantle of frozen water covered by a surface of frozen nitrogen. Originally classified as a planet, Pluto’s origins were puzzling to scientists as its elliptical orbit was very different to the other planets. Only when Kuiper Belt objects started to reveal themselves in the early 1990’s did the true nature of Pluto’s genesis start to emerge. Like many large bodies in the Kuiper Belt, Pluto was formed from the remnants of an accretion disc that surrounded the Sun during the very early stages of the Solar system. The material in this disc failed to coalesce into objects large enough to form planets. Pluto was one of the larger objects – a dwarf planet. Pluto has several moons the largest of which is Charon. 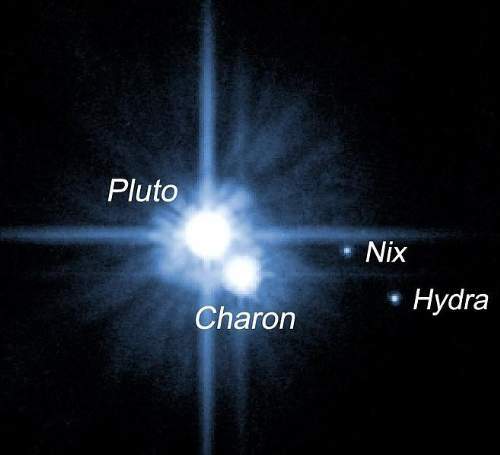 Hydra and Nix are two other moons that were discovered in 2005. Strictly speaking Charon should be considered a dwarf planet that forms a binary system with Pluto. Nevertheless, it is still classified as a moon. In 2011 and 2012 two more smaller moons were discovered. As the New Horizons spacecraft flies past Pluto and its moons it may find more natural satellites orbiting the dwarf planet. Originally, Pluto was thought to be a planet – the so-called Planet X that astronomers believed was missing from their model of the Solar System. With the discovery of the myriad of large bodies that are orbiting the Kuiper Belt, calling Pluto a planet started to become problematic. 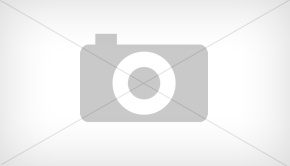 In 2005 the existence of a larger body, Eris, became known. Pluto’s status as a planet therefore became increasingly more difficult to justify. The following year in 2006 planets were redefined with three criteria. The first two – the body must be orbiting around the Sun and large enough for gravity to turn the shape into a sphere – were met by Pluto. The third condition – that the object had to clear the region of Space around its orbit was a game-changer. 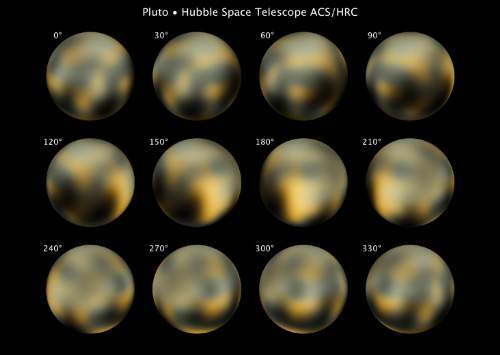 Pluto did not meet the last criteria and was reclassified as a dwarf planet. 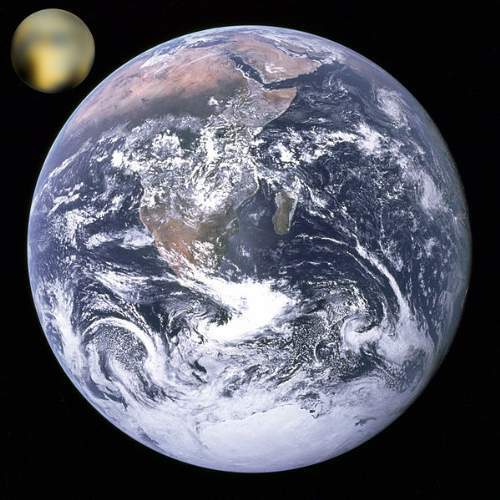 Though the decision caused controversy, enough for several public protests in the United States, the new classification of dwarf planet has been accepted by the scientific community. Contrary to popular belief, Pluto was named after the Greek god of the underworld. Venetia Burney, an 11-year old girl from England, chose the name aided by her love of classical myths. Burney’s pick saw off competition from over a thousand entries in a worldwide challenge. The cartoon character Pluto was probably named after the Kuiper Belt as the naming of the dwarf planet pre-dates the Walt Disney creation. 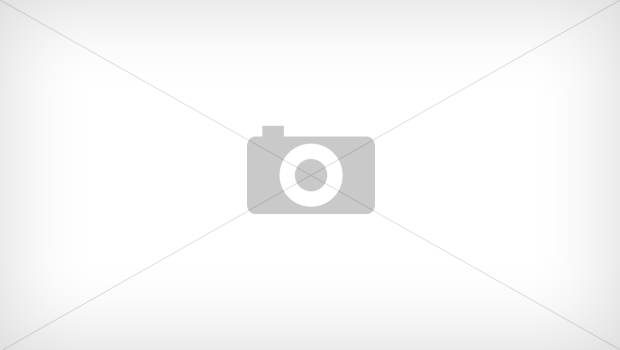 In 2015 the New Horizons spacecraft will fly past Pluto and its moons. It will provide us with unprecedented information into what Pluto’s surface looks like, what it is composed of, as well as a vast wealth of knowledge. Until this time we shall just have to content ourselves with the photographs taken by the Hubble Telescope. Check out Yellow Magpie’s The Kuiper Belt: Home To The Dwarf Planets for more insight into this frozen region of the Solar System. You may also wish to take a gander at The Solar System And Beyond: A Guide To The Cosmos. Cosmos is a highly recommended book. It contains large, full-page pictures of the asteroids and writing on the subject by the highly competent author, Giles Sparrow. For people living in Ireland or the United Kingdom, you can access: Cosmos from here. For those who live in Canada, you can obtain: Cosmos here.